Traditional network television programming has always followed the same script: executives approve a pilot, order a trial number of episodes, and broadcast them, expecting viewers to watch a given show on their television sets at the same time every week. But then came Netflix's House of Cards. Netflix gauged the show's potential from data it had gathered about subscribers' preferences, ordered two seasons without seeing a pilot, and uploaded the first thirteen episodes all at once for viewers to watch whenever they wanted on the devices of their choice.In this book, Michael Smith and Rahul Telang, experts on entertainment analytics, show how the success of House of Cards upended the film and TV industries--and how companies like Amazon and Apple are changing the rules in other entertainment industries, notably publishing and music. We're living through a period of unprecedented technological disruption in the entertainment industries. Just about everything is affected: pricing, production, distribution, piracy. 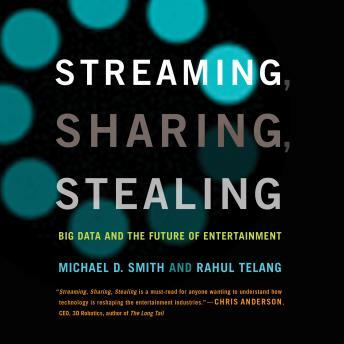 Smith and Telang discuss niche products and the long tail, product differentiation, price discrimination, and incentives for users not to steal content. To survive and succeed, businesses have to adapt rapidly and creatively. Smith and Telang explain how.How can companies discover who their customers are, what they want, and how much they are willing to pay for it? Data. The entertainment industries, must learn to play a little 'moneyball.' The bottom line: follow the data.